This is how Dan Craig, Senior Director of Facilities Operations for the NHL, described his thoughts while standing inside Rogers Place on March 10, 2016. Craig’s visit marked yet another milestone for the coming of Rogers Place, as he oversaw the ice slab foundation being installed on Thursday. The 12-hour process involved approximately 20 workers monitoring levels, installing over 16 kilometres of cooling pipe, conducting pressure checks and meticulously smoothing out the cement as it was being carefully guided by a large hose. 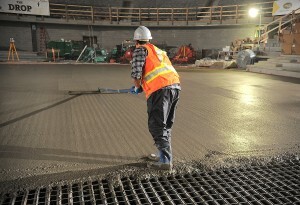 Having visited all the NHL facilities, overseen ice surfaces for Olympic games as well as the Heritage Classic games, Craig is well acquainted with the careful process involved with installing an NHL ice slab foundation. Oil Country is where Craig made his start, beginning in Jasper and eventually working as an ice technician with the Edmonton Oilers starting in 1987. Before being recruited by the NHL in 1997 for facility operations, Craig left behind a reputation for the Oilers as arguably having the best ice in the League. He continues to give credit to his dedicated and hardworking team for this reputation. “It can’t even come close,” replied Craig when comparing Rogers Place to other facilities he has seen in the NHL. Nearly 40 cement trucks were needed to complete the project, with over 320 cubic metres of cement being poured (approximately one-half of a kilometre of standard city sidewalk). “This is definitely a milestone,” Trevor Sundquist, Structural Superintendent for PCL Construction, commented on the pour. Below the eight-inch ice slab is another 16 inches of concrete structural slab sitting overtop the parkade. Most ice slabs are poured on a subbase made of clay and gravel, explained Sundquist, however Rogers Place is “one of very few in the NHL” that will sit atop a parkade. Not only does the parkade beneath the ice surface make Rogers Place unique, but the building will host many more industry-leading technological and structural designs. This includes the high-definition scoreboard, which will be the largest in the NHL, whose installation will mark the next major milestone for Rogers Place in the coming months. “There are many exciting things ahead for Oilers Entertainment Group and for the city,” said Black. 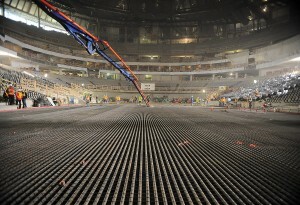 Previous post Video: Rogers Place Ice Slab Pour Next post Oil Kings ready to call Rogers Place home!